What can I say about authentic Venetian Italian food? When I was in Venice, what impressed me most was the grilled octopus from this little restaurant by one of the canals. But the most impressive was that I did not have a bad meal while I was in Venice; every meal was cooked using fresh ingredients and everything was made with care and love. Here I am eleven years later, I came upon Osteria Laguna Bar and Restaurant with my family during the holiday season by chance. Although Osteria Laguna is a well-established upscale restaurant in a prime location of the City, the food is not pretentious; the food is homey, high quality and even satisfies the palate of the youngest eater. 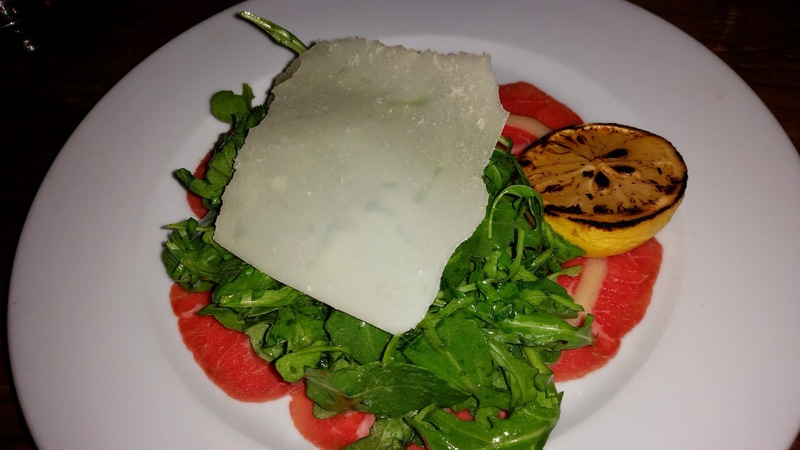 CARPACCIO DI MANZO: Thinly sliced raw beef served with baby arugula, shaved parmesan & a lemon mustard dressing. Never was a fan of the carpaccio and was also wary of the raw beef. Raw fish is perfectly fine for me but anything raw from a land animal is something totally different. Nevertheless, once I get over the initial hesitation, this carpaccio was highly enjoyable. The combination of the slightly bitter arugula, umami from the parmesan and the clean-tasting beef was perfect. The textural contrast between the leafy veggie, shaved hard cheese crumbles and slightly moist and soft beef slices was perfect. 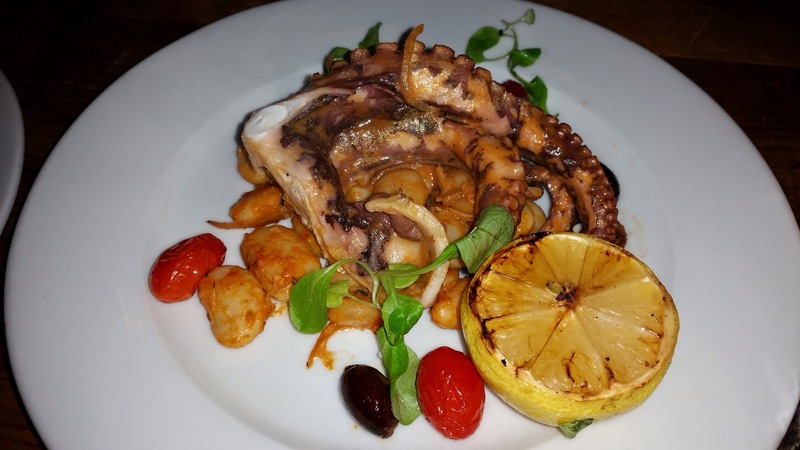 POLPO AL CARBONE: Grilled baby octopus, grape tomatoes, corona beans, black olives & red onions. I am a fan of grilled octopus. I seek out grilled octopus in any restaurants. I pick restaurants often because they have octopus on their menu. This was very nicely done. Loved the corona beans. The olives were a nice touch. Best part of this dish is that you get enough of the octopus to really satisfy the craving. 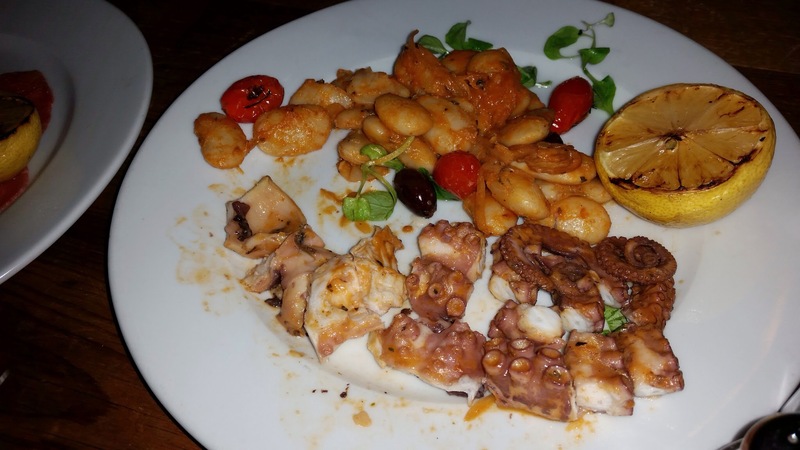 Most restaurants’ grilled octopus only gives one tentacle and that is not enough for eating! That is sampling. This is what it looked like when the octopus was cut up and ready for be shared. Buon appetito!! 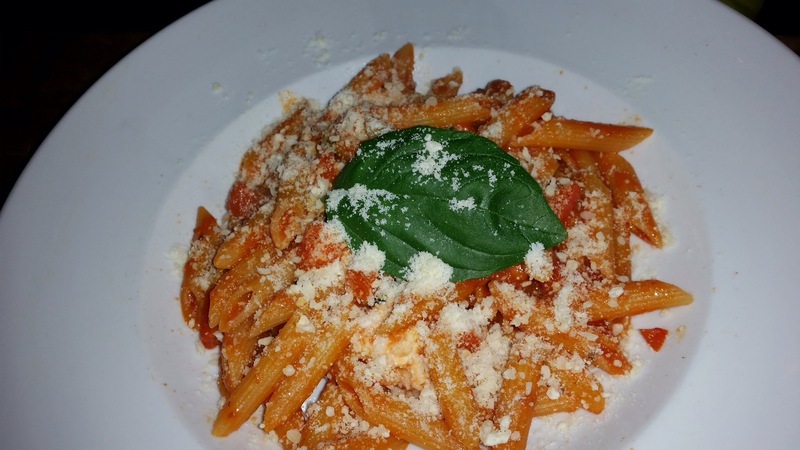 PENNE AL POMODORO E MOZZARELLA: Penne pasta with tomato sauce & mozzarella cheese. This dish may first appear to be nothing special but it is not. The youngest eater (and a picky one) in the group was so happy with this dish that she finished the entire plate. Let me be clear – the size of these dishes are Italian family sized. The portions are big. She said she could not stop eating because “it is the best pasta she has ever had.” How is that for an endorsement? 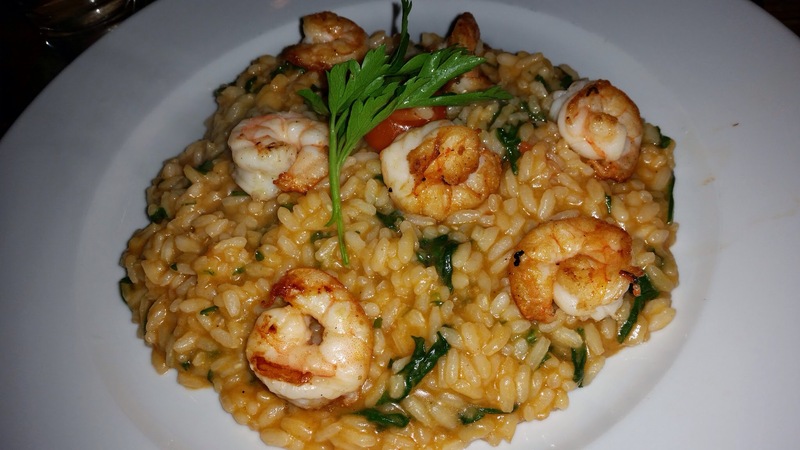 RISOTTO GAMBERI E RUCOLA: Lemon risotto with shrimp & arugula. This is a superior preparation of the risotto. The acidity of the lemon really made it shine. Unfortunately, this was not my dish and I regretted it very much. Luckily, I was able to sample some for me to realize what I missed. 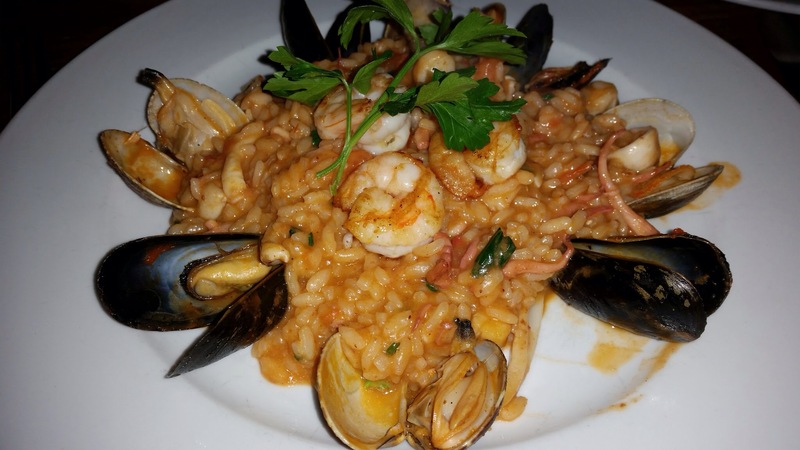 RISOTTO AI FRUTTI DI MARE: Seafood & shellfish risotto with tomato sauce. This was mine. The risotto was well prepared but it was not the RISOTTO GAMBERI E RUCOLA. In comparison, the seafood one note and added no shine to the risotto. If it were not contrasted, I would have said that it was good. Crème Brûlée: This was the second best Crème Brûlée I have ever had in recent history. 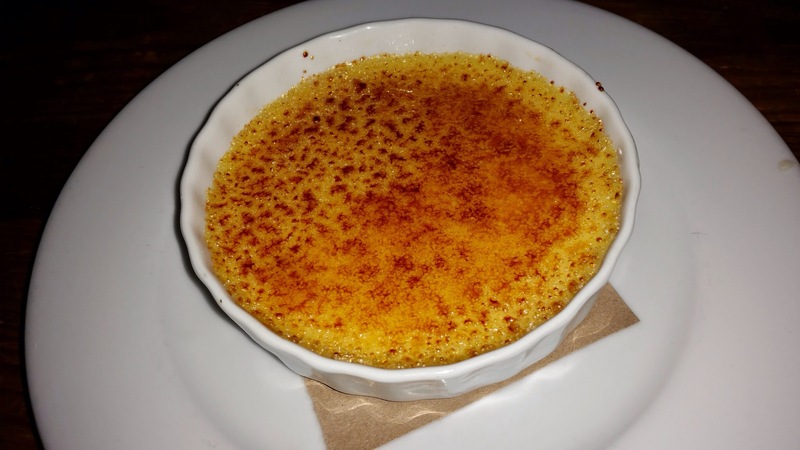 The best one is the Black Sesame Crème Brûlée at Cha-An; see my post here. In fairness, this was the traditional preparation for the crème brûlée. It was rather fantastic and I polished it off after having all the above dishes. No, it was not a small-sized dessert. I am not a big eater and this really tells me how good the crème brûlée was. 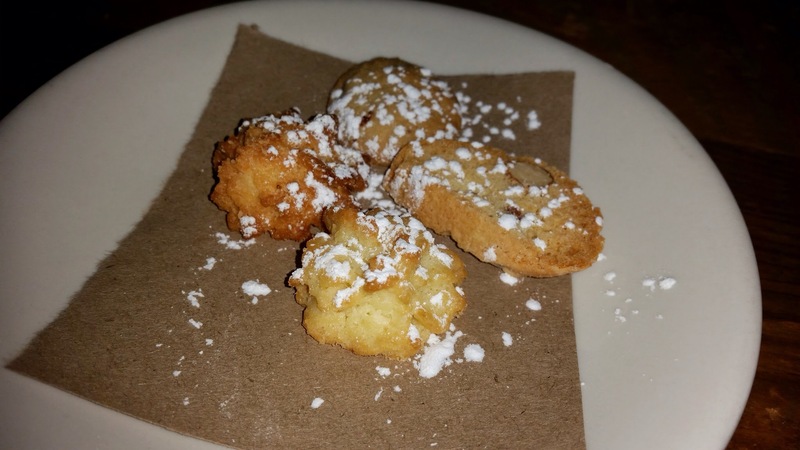 And we ended the meal with some good Italian cookies, complimentary of the restaurant. 🙂 Last but not least, the bread and the bread sticks were to die for. This was a very happy end to a Thanksgiving dinner substitute. Highly recommended. Authentic Venetian food rocks. Will need to go back again myself. I’ve always wanted to try grilled octopus. I think will try this restaurant out. Thanks for the info. Then try the Italian version from this post. Have fun and let me know what you think!! Previous Previous post: Max Brenner in NYC – Creating a New Chocolate Culture Worldwide and Happy New Year with Love! Next Next post: Soba Totto: Soba & Yakitori Bar in NYC – Hello, Anyone Speaks English Here? We Are Ready To Be Seated Now.